My little brother has a nickname for it: Gross Out. He has a point. Outlets are one of the places commodities go before they die, not a place to find fresh, wholesome food. It’s a place are where companies send their surplus of hotel and hospital food. It’s a place for the expiring but slightly edible. But I was wrong. I never thought I’d love you, Grocery Outlet. But I do. My friend Michelle is a mother of twins and an accredited expert in grocery shopping (and other amazing child-rearing and non-child-rearing skills). She’s been lauding the glories of Grocery Outlet for years, and I was often skeptical of this mystical land of cheap milk and discounted honey. I finally heeded her advice and had a blast saving all kinds of money. However, shopping at Grocery Outlet should not be approached in the same way you approach other grocery stores. You’ll become overwhelmed with all the items you don’t actually want or need, and end up missing all the great deals. Following a few ground rules will help keep dollars in your pocket and the cheap but unnecessary frozen cream puffs out of your basket. Not all Grocery Outlets are created equal. My first Portland experience was at the Hollywood store a few years ago, and it was a complete Gross Out. It’s small and dark and their selection isn’t (or wasn’t at the time) great. However, the Milwaukie store rules! It’s bright and spacious, just like a regular grocery store. I was amazed with the selection, especially of natural and organic brands, such as Newman’s and Choice Organic. 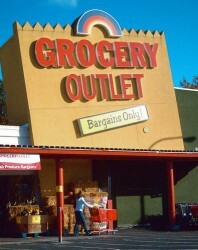 If you are first dismayed with a Grocery Outlet, try an alternate location. Stick to the items you normally buy and stock up. It was very tempting to buy items that weren’t on my list because they’re so cheap. But that’s counter productive to the goal of saving money. Adhere closely to your list but stock up on pantry items you use regularly. I use canned, organic bean on a very regular basis, so at $0.99 ($1.69 at Trader Joe’s) I bought several cans of each variety and avoided the Amy’s Pizza’s regardless of the deep discount. If you don’t know where to start, begin with typically expensive items. Flour tortillas must be of the most over-priced items at the average grocery store. The ones I like at Fred Meyer are more than $3 for a bag of 10. Cheese, tea, coffee and alcohol also put a major dent in our grocery budget. I began with these items because I figured that’s where I would find the biggest savings. I was right: Cabot Sharp Cheddar for $3.99/lb, flour tortillas for $1.69, avocados two for a dollar. Don’t be afraid. Yes, at Grocery Outlet you will find many items close to their “sell by” date. But nothing on their shelves (according to their website) is sold after the expiration or sell by dates. Meaning the meat, cheese, milk and eggs you take home are still perfectly safe for you to eat. Not going to eat that pork tenderloin in the next couple of days? Freeze it. Same with cheese or butter that’s nearing its prime. The “best by” dates are different. When an item is past its “best by” date, it doesn’t mean it’s bad. It means by this time next year, it might be rancid, but eat it in the next couple of weeks, it’s perfectly fine. And, really, stop being such a wimp.